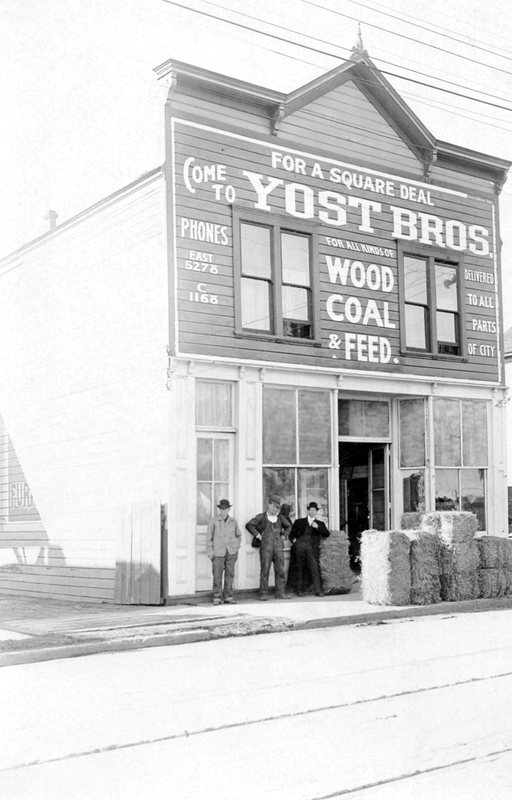 Yost Brothers Feed and Fuel Store was owned by Henry Peter, John and Conrad (Jr.) Yost, The brothers were dealers in wood, coal and feed. The store was located at 411 Union Avenue North (now 1927 NE Martin Luther King Jr. Boulevard). The Yost brothers were born in Norka, Russia, the offspring of Conrad and Elizabeth Yost, early pioneers in Portland. The family arrived in Albina on October 12, 1890. The three Yost brothers pose in front of their store. Photograph courtesy of Linda Scoggins.